"In a small town, on a peaceful lake, a mythical creature is about to surface." This delightful family film from 1995 is about a Canadian family in British Columbia for vacation. The father is a famous radio psychologist who is a total workaholic. His kids are determined to somehow bridge the emotional gap that lies between them and their Dad. They discover that a local lake monster, up until now just rumored to exist to help bring in tourist dollars, is actually real. 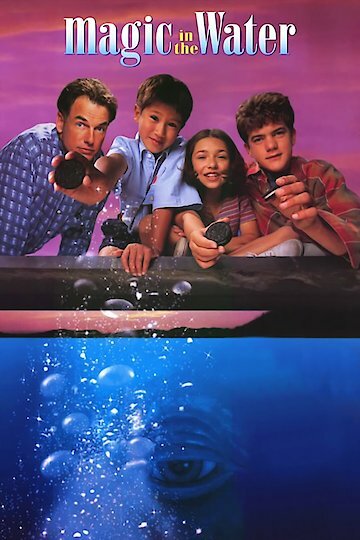 With the aid of the monster the children find a way to get closer to their father, while preventing polluters from destroying the lake monster's home. Magic in the Water is currently available to watch and stream, download, buy on demand at Amazon Prime, Amazon, Vudu, Google Play, FandangoNow, iTunes, YouTube VOD online.